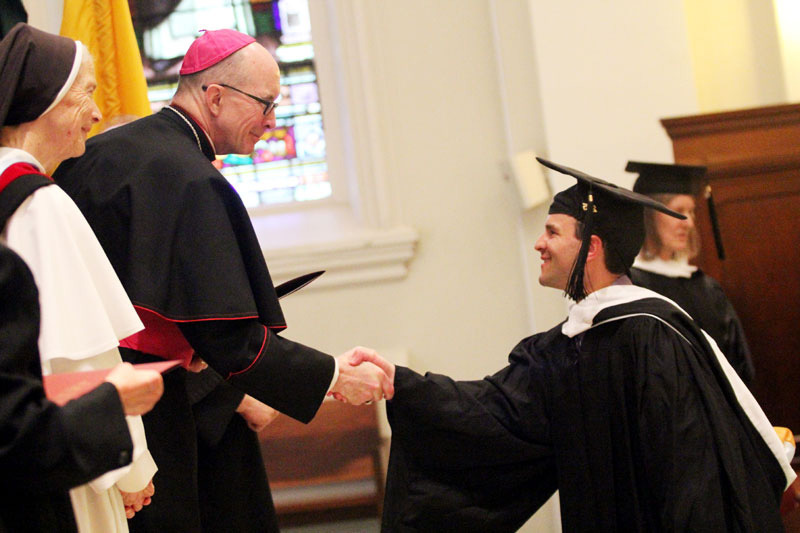 The School of Theological Studies at St. Charles Borromeo Seminary in Wynnewood conferred degrees on 40 students at the commencement May 18 in the seminary’s Immaculate Conception Chapel. Bishop Timothy Senior, rector of the seminary, presided at the ceremony at which 11 students received their Master of Arts degree in theology, two received their Roman Catechetical Diploma (an undergraduate degree associated with the Vatican) and 27 received their certificates from the Archdiocese of Philadelphia’s Church Ministry Institute. One student, Steven Miola, completed his degree before he died this spring. His posthumous degree was accepted by his wife, Paula. Mother Assumpta Long, O.P., gave the graduation speech. As mother superior of the Dominican Sisters of Mary, Mother of the Eucharist, Mother Assumpta traveled all the way from the motherhouse in Ann Arbor, Mich., for the occasion. The order sends sisters to St. Charles each summer for the Summer Program for Religious, and her visit solidified the longstanding connection between her congregation and the seminary. Also present at the commencement were Augustinian Father Augustine Esposito, seminary vice rector; Jared Haselbarth, director of the School of Theological Studies; and Blanca Herrera, coordinator of the Instituto Catolico para Evangelizacion (Catholic Institute for Evangelization). Following the commencement ceremonies a light reception was held in the lower level of the seminary’s Ryan Memorial Library.